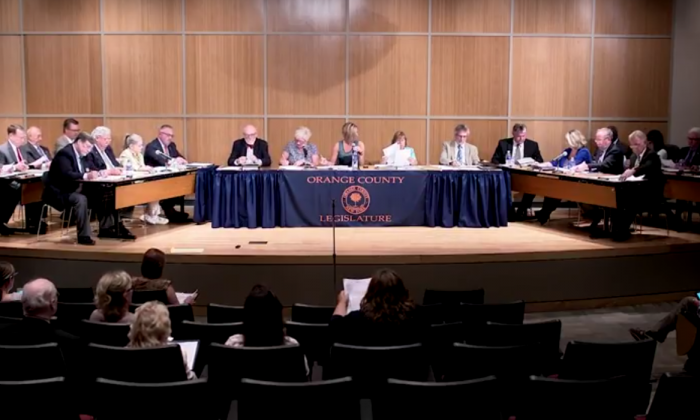 GOSHEN—At the July 7 meeting of the Orange County Legislature, legislators voted unanimously to send back to committee a bundle of proposals that would increase pay for themselves, the county executive, and the county clerk. The proposals would give a 2.75 percent pay increase over four years starting in 2018. This would pick up from a series of local laws passed in 2013 that froze pay for the same officials through 2017. The proposals passed with little opposition in two committees, but were also unanimously sent back to committee with no discussion following a speech during public comment by a resident opposed to the increases. “This was done under the guise that county financials were in dire straits. Now they’re not in such dire straits. And yet those of you who will vote to generously pad your own full pockets, I do not know how you sometimes sleep at night,” she told legislators. The justification for the raises given during the committees were that county legislators have had their pay frozen since 2013 while managers, union employees, and department heads have all gotten raises. Those raises average about 3 percent, said the county’s Commissioner of Human Resources, Steven Gross. Those who were for it argued they would not be raising their own salary because it would take effect in the next term. Legislative Council Antoinette Reed said that compared to other counties where legislators have staff, Orange County legislators do more work themselves, so a pay increase was justified. “A legislator recently came in and said, ‘Who handles my constituent calls?’ and we said ‘You do,'” she said at the June 22 Rules, Enactments, and Intergovernmental Relations Committee meeting. Minority leader Matthew Turnbull said after the legislature meeting he supported pay raises for legislators, pointing to austerity measures they undertook in 2013 when finances were tight. Besides pay freezes, they eliminated their collective $12,000 travel budget and started contributing 12 percent towards their own healthcare. He did not support raises for heads of committees or party leaders like himself, however, which was one of the proposals. While he said he did feel being minority leader was more work, he thought all legislators’ pay should be raised evenly. On the other side was legislator Jeff Berkman, who thinks pay for legislators should go down if anything. He was one of two who voted against the proposals in the Rules Committee, saying the raises are not based on merit. What they both agreed on was that the county executive did not need a raise. At $182,177, he makes $3,000 more a year than the governor, they pointed out. In discussing the appropriate raises for elected officials, the committees looked at different numbers, including changing the percent increase over the four year period. They finally settled on 2.75 percent because it was less than 3 percent, the average raise rate in the county, and more than 2 percent. The following compensation for officials in surrounding counties was collected by Epoch Times as a reference.